The Boundary Gallery, Advanced Graphics London and the Bankside Gallery are delighted to announce major new exhibitions of work by Anita Klein. The exhibitions will run concurrently and feature new works created by the artist since her last solo shows nearly three years ago. Her artistic intellect and use of humour in capturing moments such as Nige looks for the Free Toy or The Salad are a winning combination. Perhaps the popularity of Klein's work and the reason why its everyday content has such appeal is best summed up by herself, If I lost everything tomorrow, what I would look back on longingly would be the ordinary moments, the things we do every day and don't even notice how wonderful it is that we're doing them. Klein's influences include Japanese woodblock prints and early Renaissance muralists such as Giotto, Piero Della Francesca and Masaccio. Like theirs, hers is an art of stillness, of action caught and suspended in the transfiguring moment. This is especially apparent in her the latest paintings. She combines printmaking and painting in her working method, making etchings, woodcuts, lithographs and screenprints first, and using these as preparatory sketches for her much larger oil paintings. 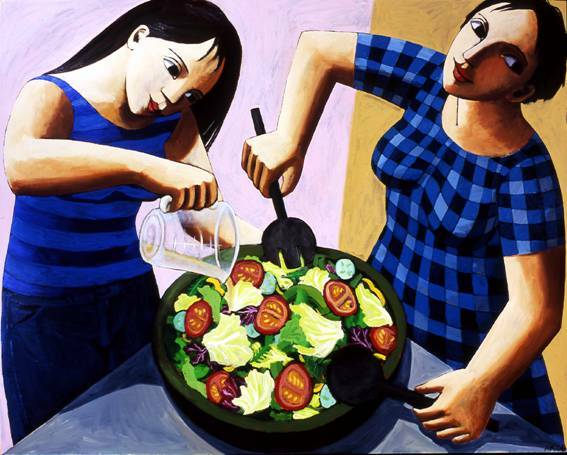 Anita Klein has exhibited her prints and large oil paintings extensively in the USA, UK, Europe, and Australia. Her work resides in many private and public collections including the Arts Council England. She was elected president of the Royal Society of Painter Printmakers in 2003. A fully illustrated 72 page book; "Anita Klein, Painter Printmaker" with an introductory essay by Mel Gooding will be published by Five Leaves Publications in October to coincide with the three exhibitions in London.